Heather Doyle is a blacksmith, a welder, and a metal sculptor. She finds inspiration for her work in a machinery shop. Heather Doyle is a metalsmith, a teacher of metal arts, and an activist for public art in the Twin Cities. She produces and sells custom metal sculptures through her business, INDUSTRYelle. We caught up with Heather at Amble's Machinery, where she was working on a sculptural piece to gift to her young daughters. ARTIST BIO Heather Doyle has studied welding and metalsmithing from an artist's perspective for more than a decade. She continues to explore the mediums of heat and metal through her business, INDUSTRYelle, producing metal sculpture and custom fabrication on a commission basis. 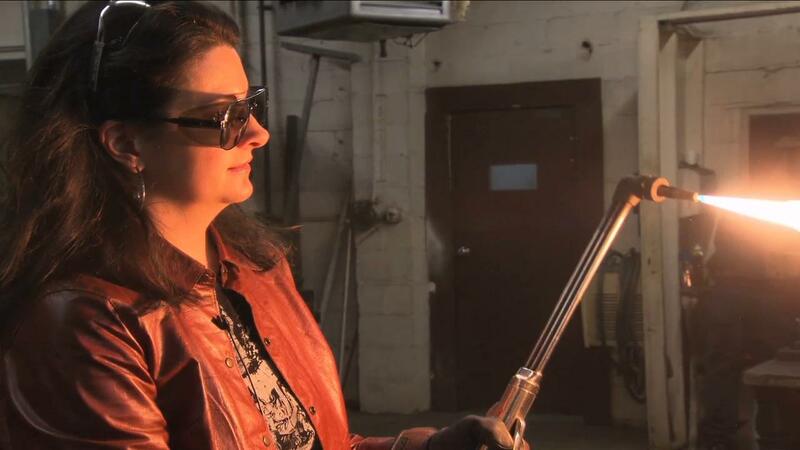 She is an instructor of Sculptural Welding and Blacksmithing at the Minneapolis Community and Technical College as well as an instructor in Metal Arts for the University of Minnesota's Summer Youth Program. Heather is the creative force behind "The SPEAK Project," a South Minneapolis public art initiative, produced in collaboration with FORECAST Public Artworks, which uses various forms of visual and performance art to encourage youth to explore the subject of diversity and express their voices through creativity. Heather is the Artistic Director of the Chicago Avenue Fire Arts Center, a member of the Artist-Blacksmiths' Association of North America (ABANA) and a dedicated community activist. Heather Doyle is a blacksmith, a welder, and a metal sculptor.